Hi all my gardening friends. 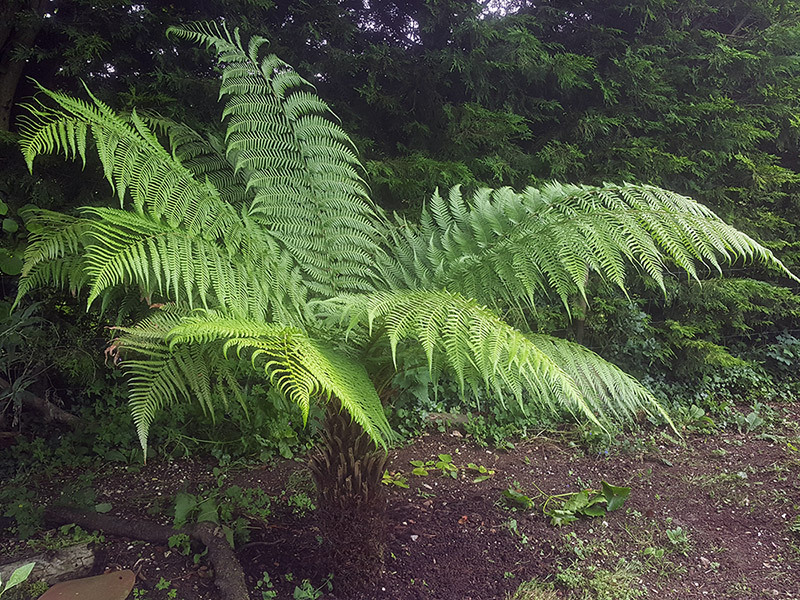 I just had to tell you about my absolute favourite plant at the moment, my gorgeous Tree Fern or Dicksonia Antarctica as it’s often called. Tania bought it for me on my 50th birthday when it was about 18 inches high. Now, 7 years later it’s grown into this wonderful specimen! 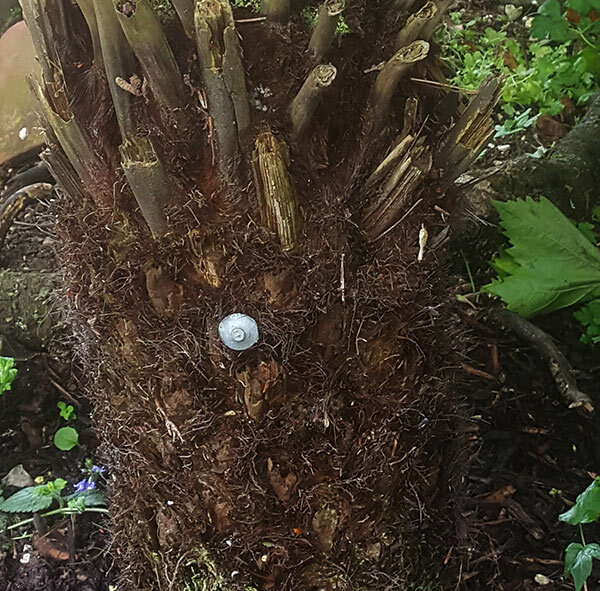 What I love so much about tree ferns is the wonderful contrast between the rich almost lime green leaves and the hairy, almost weird looking trunk! Tucked away in a slightly humid (when the sun shines) shady part of the garden, next to the stream, it just seems to love it. It’s taken me a while to find the perfect growing conditions. 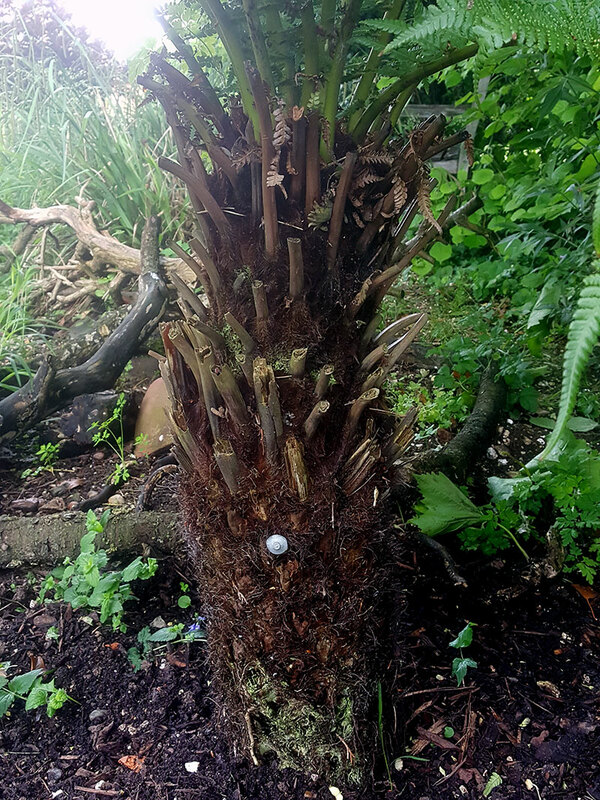 Originally planted in a big clay pot I think it didn’t like the occasional dry conditions. 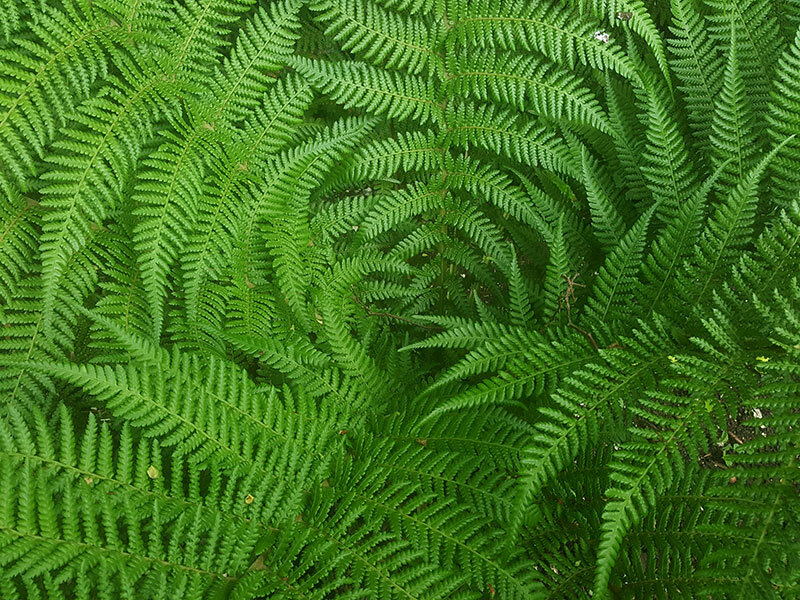 If you’re thinking about growing your own Dicksonia, my advice is take your time and find a spot with the perfect growing conditions. At upwards of £100 a go for a medium sized tree it can be an expensive mistake if you get it wrong. I keep it well watered, especially the crown of the plant where the fronds grow. 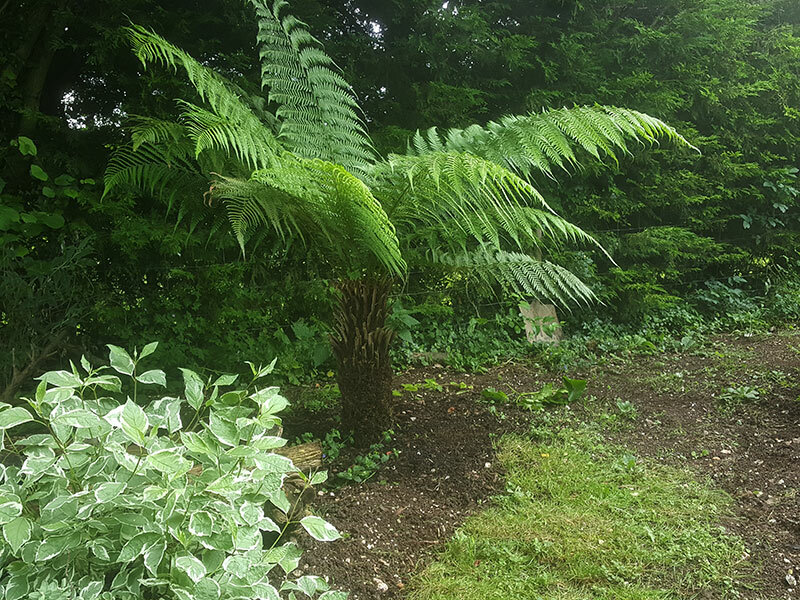 I remove a few dead fronds each summer and it’s none the worse for it. 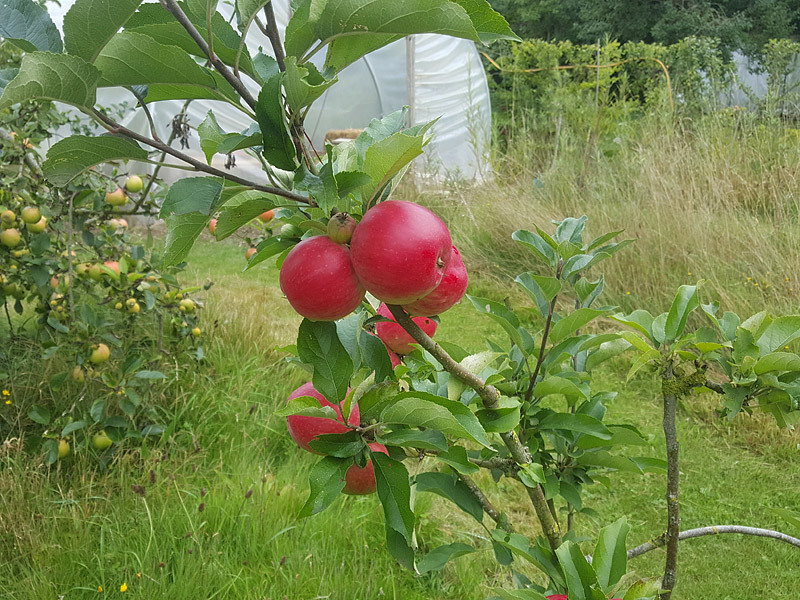 I don’t overfeed … every 2-3 weeks it gets a watering can of regular soluble plant food and apart from watering in dry conditions it pretty much looks after itself. What a plant! For the last 2 winters it’s lived outside with little protection, other than what it gets from the hedge that is. It really is the most wonderful addition to the garden. Oh, and make sure you buy from a reputable garden center as they have to be certified for sale in the UK. It never ceases to amaze me how nature just seems to know what it’s doing. Give a plant the right growing conditions and it will give back many times over. Hope you enjoy these pictures I took earlier today. There is something quintessentially English about the herbaceous border that can’t be matched in my view. If you’re lucky enough to have a herbaceous border of your own you’ll know exactly what I’m talking about! If you’re looking to create your own border then read on as we share our journey as we create a brand new border at Blackbirds. 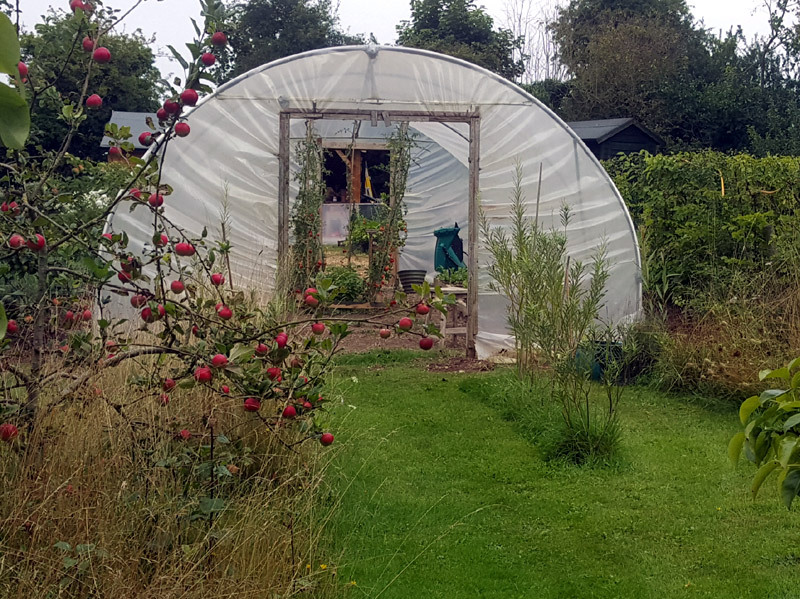 We finally finished moving the polytunnel which has given us a much better outlook from the house and to be honest … it feels like it should have been there in the first place! As you can see from the photo below it’s left us with a fantastic space. It’s approximately 26 feet by 16 feet which is simply crying out for a lovely mixed herbaceous flower border. Planting a new border is great fun and I’ve been lucky enough to create two borders in the garden already. But there is something not quite right about them, so this time I’m going to do my research first before I attempt to plant anything. After a brief consultation period with John (30 seconds from memory), I decided we’d use one-half for more fruit and veg and the other for the new herbaceous border. Should look amazing when it all comes together. The new border will be on my neighbours side of the garden which is currently a large open space on which he stores a couple of caravans. They’re not overly offensive, but I need to find a way to hide them without having to put up a massive fence. I’m not a fan of wooden fence panels and I prefer to use hedges if I can as it helps to bring in the wildlife. 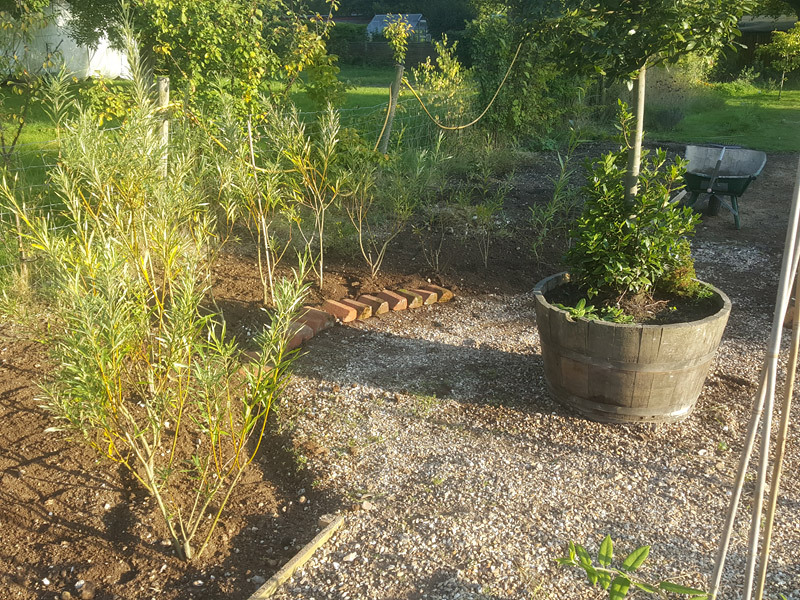 I plan to grow a few evergreen shrubs at the back of the border to create a little more privacy and to provide a nice backdrop for the rest of the plants. We struggle to grow evergreens on our chalky soil so I’m going to need to be inventive when it comes to the planting. Probably sink a few large pots in the ground and backfill with ericaceous compost. A couple of weeks ago we had a fabulous few days in Cornwall. We managed to grab the last of the late summer sunshine. Cornwall and St Ives, in particular, are simply gorgeous at this time of the year as most of the summer holiday makers have left. 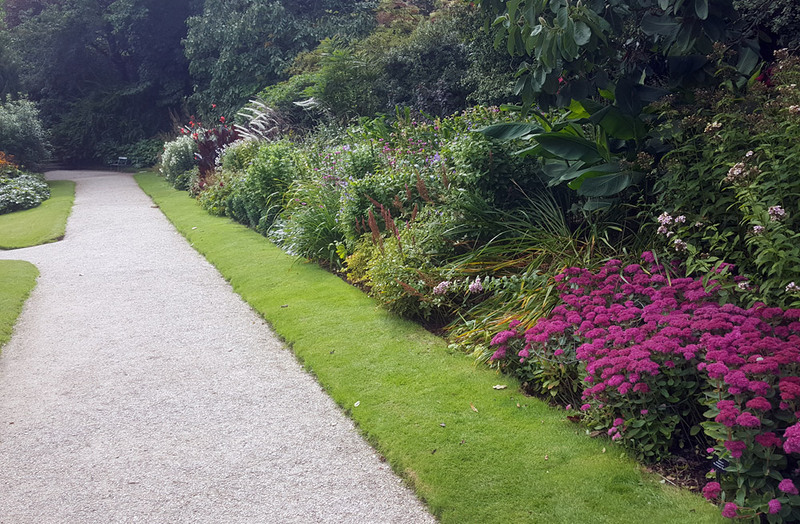 While we were in the area we visited a fantastic garden at Lanhydrock House where I photographed this amazing border with a fabulous planting scheme. The colours are predominantly light shades of pink, purple and white with the odd rich orange crocosmia which make the border really pop! Fortunately for me those clever people at Lanhydrock left a few printed planting plans in a little cubby hole alongside the border to help visitors identify the plants. Just a brilliant idea … Each one numbered with the full name alongside. 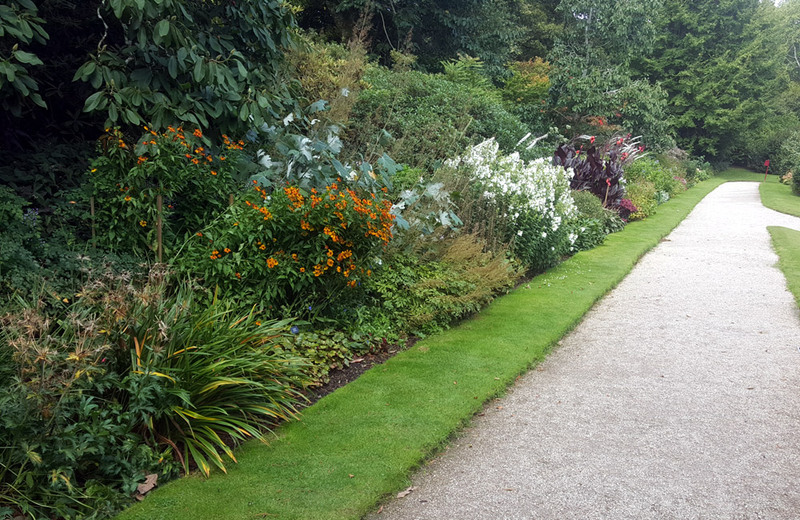 We’re going to base our planting on the border at Lanhydrock House. It is a simple basic oblong design that fits with my new space which will have a long path down the middle to add the sense of perspective. We’ll divide the area in half with one side for the border and the other for veggies. I’d like to incorporate a feature circle half way along to create a resting spot where we can simply sit on a summers evening with a glass of the fizzy stuff and watch the sun set as it drops below the tree line. 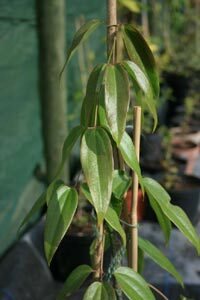 We have some willow plants that were propagated from some plants I bought John for his birthday a few years back. I’ll use those to create a little willow arbour which will be trained up and over the circle to create some shade on those barmy summer days. For the moment, I’ve put my standard Bay in the middle as a focal point. I wonder if I can find an old wrought iron seat to add a little style? … I’m thinking an old bench like those wonderful old wrought iron benches we used to see at the local cricket field. When creating any new border I like to get the paths marked out first. Nothing fancy, just a modest gravel path edged with timber edges. All recycled of course! All you need is a string line a tape measure, (to keep the width of the path consistent) and a few lengths of 3 x 1 timber. I’m using a few boards salvaged from a couple of old pallets. The only snag with wood edging is it will rot after a few years … but all you do is replace them and recycle the old ones as compost. Alternatively if you can afford it then iron edging looks great and will last a lifetime but that’s not in my budget I’m afraid. 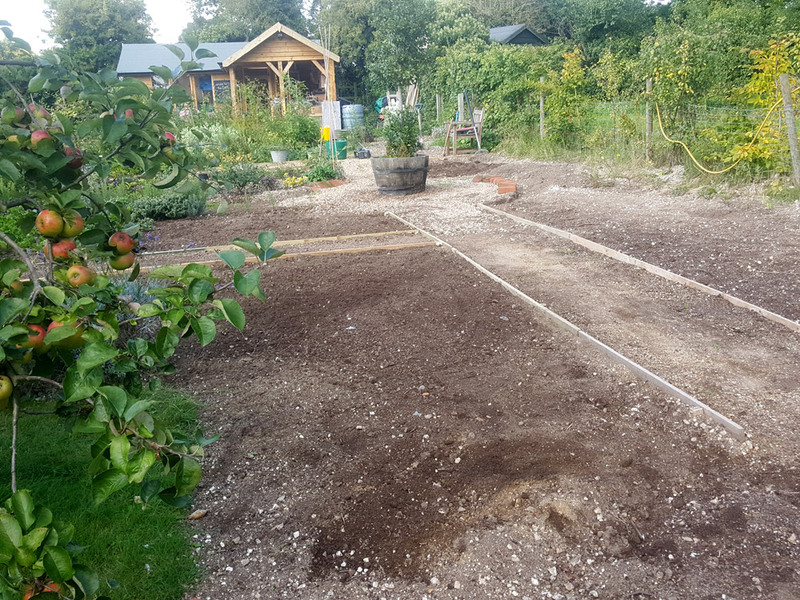 I’ve made the path approx 900mm wide which is enough for two people to pass and plenty of room for a wheelbarrow. All I do is drive in a few 2 inch squared wooden pegs about 3-4 feet apart making sure they are on the border side using the string line to keep them nice and straight. I leveled the edging as much as possible and nailed the edging to the posts. 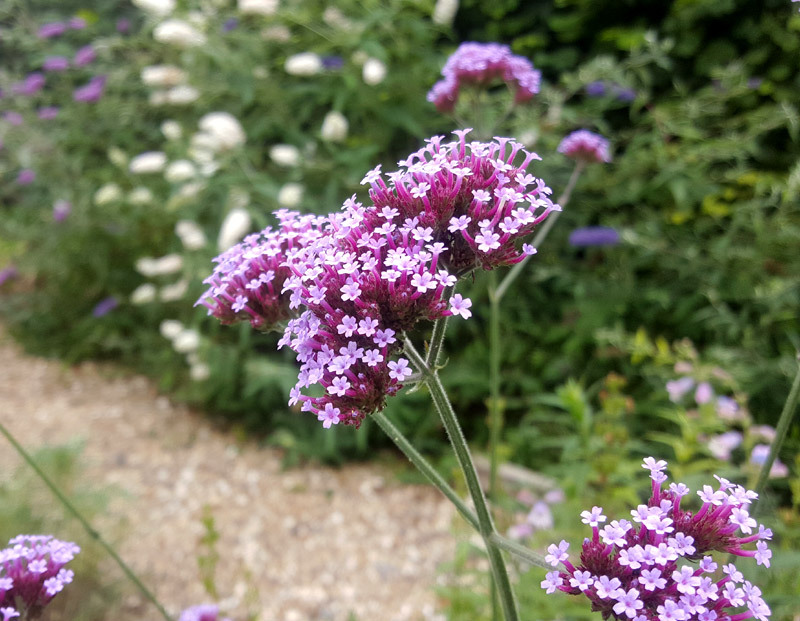 Try not to bury them too deep or the gravel on the path will simply disappear into the border which is really annoying! A minimum two inches above ground should do it. 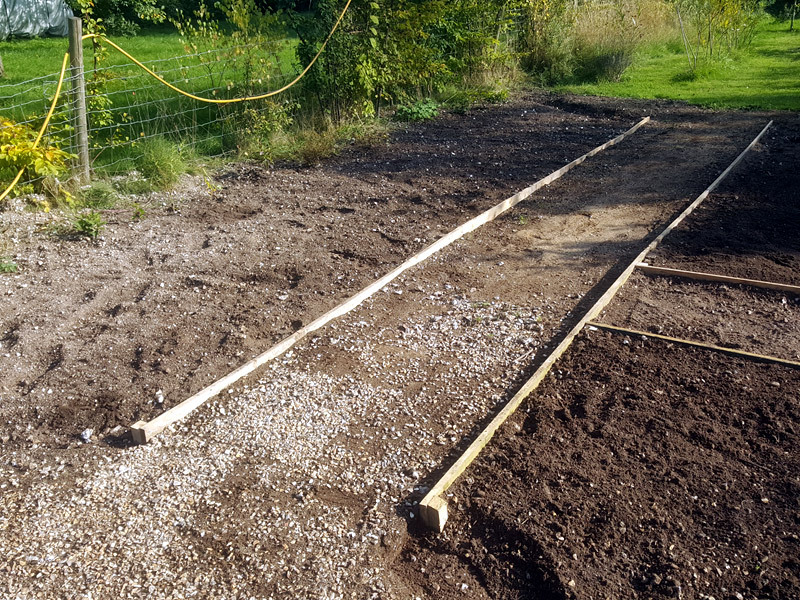 As the length of the border is about 28 feet I thought it best to divide the other side (veggie side) in half with a couple of paths using exactly the same process with the tape measure and string. Just remember to step back and eye up the lines to ensure they are straight and square to the main path. Nothing worse than a wonky path! 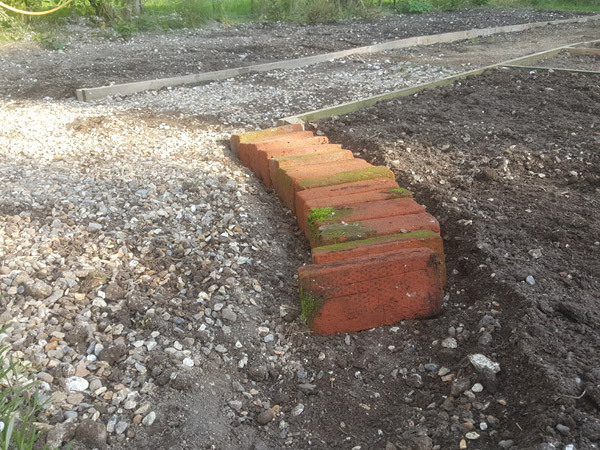 I have some bricks left over from the house build which I plan to use to edge the circle and the natural material of the bricks should help soften the overall feel and at the same time provide a nice little feature. I’ll need to buy some sharp sand and cement to finish the job. Well, the new border is starting to take shape! Next time I’ll share how I plan to approach the planting and make a start on selecting the plants. March is here … which means April is just around the corner! March is just the best month in the garden. It really feels like the darkness of winter is finally behind us! The sun starts to feel warm although don’t be fooled, the weather can bite back when you least expect it in March! Today was a fairly typical March day. We had couple of hours of warm sunshine this morning and by this afternoon we had torrential rain. I did however manage to move a few forsythia lynwood gold plants this morning. I find early March the best time to move and/or divide plants as they are still dormant and won’t be shocked by a move. Also planted a few herbs I raised in the nursery last year to outside the new workshop. Idea is to soften the hard edges of the concrete foundations and have a few herbs on hand when we bbq in the summer. 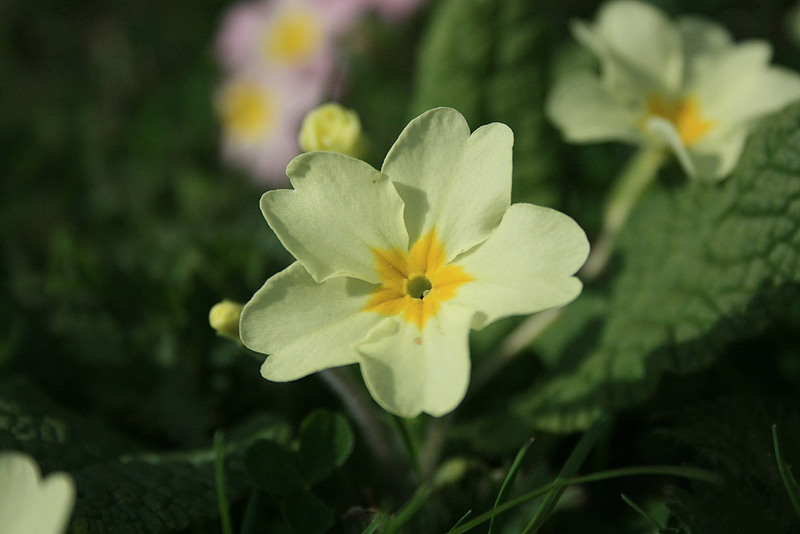 That’s the great thing about March … it really does feel like it’s time to start some serious gardening again. I don’t know why but there is some significance to the first day of March. It gives me a sense of real sense of hope. Just today I see the frogs returned to the pond and seem to be making loads of frog spawn. Naughty froggies! Also the birds have started to sing again which is another sure sign Spring is on it’s way. 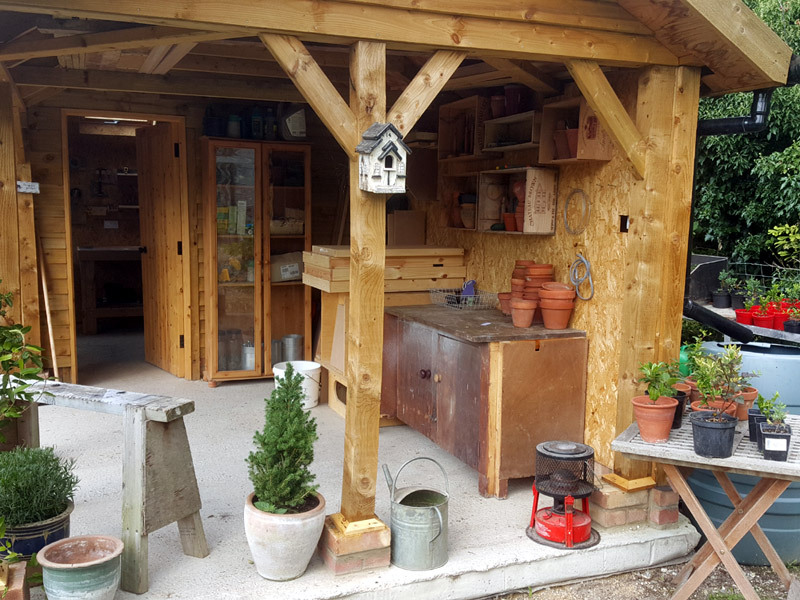 Over the next few weeks I’m going to share a series of 5 short posts detailing some of the jobs that I get up to in my gardening in the month of March. Here’s what I’m planning. Preparing for what’s e for the year ahead. Getting ready for the Spring Plant Sale. Kick start the vegetable garden. Spring treatment for the lawn. General tidy up for the wildlife pond. In this the first of my posts my gardening years starts in earnest with lots of prep! Of course we all want to get out there and start digging and planting but it’s pretty likely (in the UK at least) that the ground is still too wet and too cold to grow anything … at least not from seed anyway. But how can you tell if it’s warm enough or dry enough? That’s and easy one… just pick up a handful of soil and feel it. Does it feel cold? Try scrunching it up tight in your hand and you’ll soon know because it will feel wet and compacted. Ideally it will feel like soil should feel, friable and warm to the touch. If it isn’t then leave it well alone or you’ll just get soil everywhere … and I do mean everywhere! Certainly don’t think about sowing seeds or you’ll be wasting your time. I’ve tried early sowing in the past and I found it doesn’t really get me ahead. I’d rather wait until early April when the conditions will be better. A good barometer is to look out for the weeds. When they start growing it’s a sure sign the soil conditions are about right for sowing. I’m going to wait until April when the soil will be in much better condition to be worked. I’m fortunate to have a polytunnel so can kick start a few of the more hardy veg but even then I’ll usually wait until the third week of March at least before starting. Onion sets are about the only thing and a few brassica that I have growing at the moment. Apart from onion sets and a few brassica I tend to wait until at least the third week of March before I start sowing under plastic. One job I always do this time of the year is to turn the compost heap. The good stuffs often at the bottom of the pile so I like to get it to the top ready to scatter onto the vegetable garden when the weather allows. You can of course go for all the double digging stuff but I rarely double dig. As we garden on chalky soil any double digging would simply turn the chalk to the top. If you’ve never made your own garden compost then I urge you to have a try. It’s easier than you think. Treat the fences to a paint job. Early March is the time of year I service the various fences around the garden. Most of the fencing around our plot is post and rail which need some form of preservative treatment if they are to last. 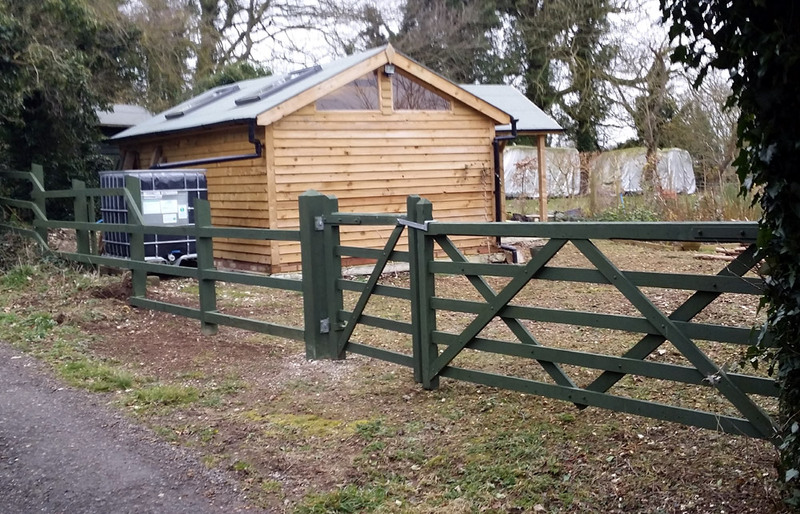 All to often we spend money on expensive wooden fences or perhaps an art studio at the bottom of the garden, but we forget that wood will rot over time if it’s not treated. It’s not the most exciting job in the world but I get a great sense of satisfaction when the job is done. You don’t have to stick to the usual green or black, there are loads of colours out there to choose from. Just make sure you use a bucket and a decent size brush to do the job or you’ll be there forever. Time for a good tidy up. I find early March is when I feel the need to have a general tidy up in the garden. The winter can take it’s toll and I usually end up retrieving plant pots and all sorts of stuff from my neighbours plot. Time spent sorting through your pots and tidying up the canes and hazel sticks pays dividends later in the year when if you’re like me you’d rather be working with the plants. So if you do nothing else in the garden this week try to have a general sort round and look forward to a few stress free months in the summer. In my next post we’ll look at giving the polytunnel a service and set about the next phase of my plant nursery in readiness for my Spring plant sales. As always any questions or comments please feel free to leave below. 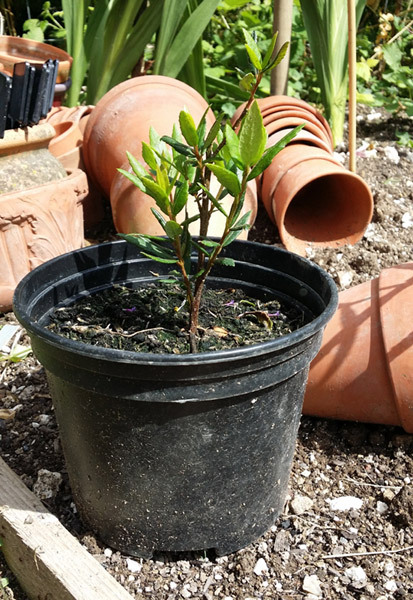 PS: If you’re interested in running your own plant sale to make a little extra money perhaps for your family or a favourite charity then you might find this post helpful. 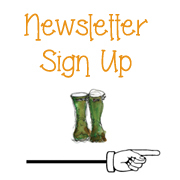 Also if you’d like to join our mailing list then you’ll receive a copy of my guide to frugal gardening which has loads of tips on how to start your own plant nursery in your back garden. Help! … Do You Know The Name Of This Plant? 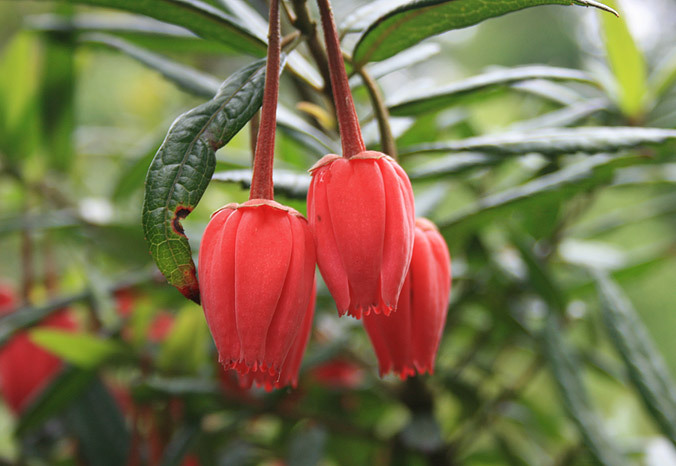 I’m hoping someone is going to be able to help me today to find the name of this plant. I bought it two years ago from the plant nursery at the Lost Gardens Of Heligan. 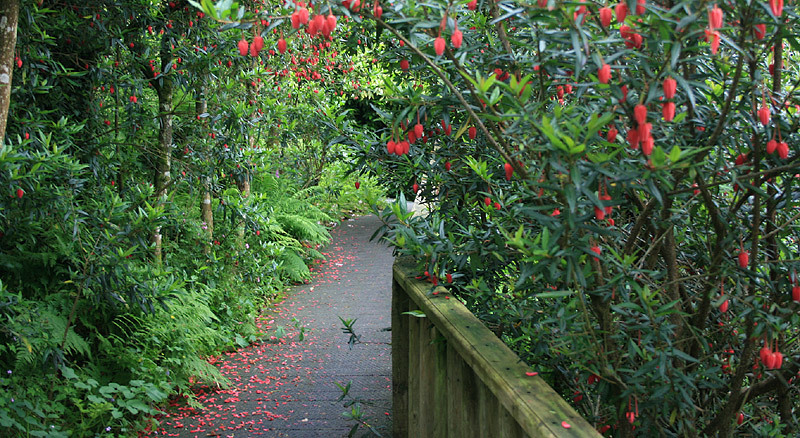 I’d seen it while walking round the gardens and thought it had the most beautiful deep red flowers which cover the plant in June and July. I believe it’s an evergreen and grows to approximately 5-6 feet. Not long after I got home the leaves started to drop and the plant looked to have died off completely. 😦 At first I thought it might be deciduous but this was the end of June after all. Anyway rather than throw it away something told me I should hang on to this little plant and stuck it behind the polytunnel for the winter. Then earlier this year to my surprise it started to grow back. It’s not as full as it was when i bought it but I’m just delighted it’s survived and I didn’t give up on it at the first sign of trouble. This where I really need some help. Unfortunately I lost the label and have no idea what the name of the plant is? There’s a lesson here for the would-be plant collector. As soon as you get any new plant home record the full name and the date you acquired it. After all it’s easy these days with mobile phones having a a camera of some sort.This summer I’ve gone one step further for the nursery and downloaded a great little free ‘App’ called Evernote.All I do is take a picture of the plant on my phone and add a couple of notes making sure to include the full name of the plant and the date I bought it. This information along with the photo is automatically stored in the cloud, which basically means I can access my plant list from my phone, tablet and/or pc from pretty much anywhere. Now whenever I need to refresh my memory about a plant I just pull out my mobile and hey presto I have access to my complete library of plants. How cool is that! There’s plenty of information out there about Evernote but I will post a more detailed piece about this great little app and how you can use it to create your own plant list . Only wish I had it when I left Heligan that day! If you know anything about this little plant I’d be most grateful for any information you can pass on. I’ve also noticed it’s a slow grower which might be down to the growing conditions, so any advice would also be most welcome. I think of April as the ’emerald month’ because it’s the time of the year where everything is bursting into growth in anticipation of delivering the most amazing display in the coming months. It’s the sheer number of different shades of green from the deep green of the evergreen clematis Armandii to the lime green of the Acer’s. It’s at this time of the year we’re preparing for the busy period ahead which basically revolves around striking this years softwood cuttings from mid May through to the end of June. If you want success with cuttings then there are two things to remember. Use a free draining medium like sharp sand or a combination of sharp sand and compost. 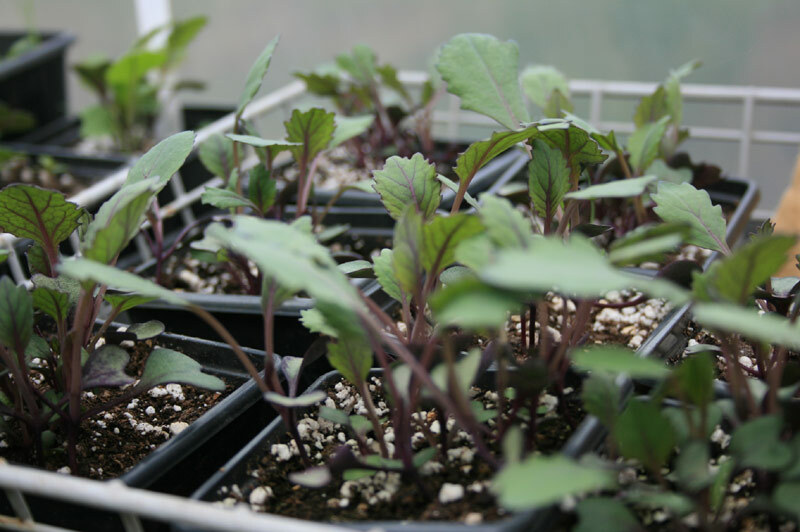 Keep the cuttings moist under some form of mist system. One of our readers wrote the other day and said “don’t you have to have lots of money to start your own plant business? My answer is absolutely not! We’re starting small to limit the financial risk and we’re only prepared to invest what we’re prepared to lose which is as little as possible! Honestly you really don’t need to spend lots of money to get started and in the coming weeks and months we’re going to show you how you can get started with very little investment. Talking of clematis Armandii ours has just finished flowering. 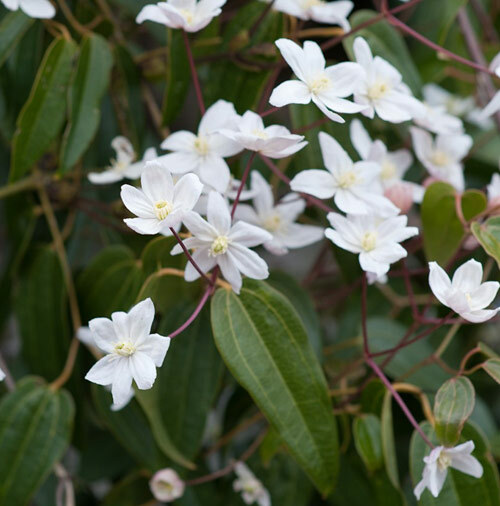 Of all the flowering clematis I think Armandii has the most intoxicating scent and it’s an evergreen so will give you a glossy green backdrop in the winter. Throw in to the mix a plant that’s really easy to propagate and you have almost the perfect plant! This cutting was taken in June 2012 and two years on has grown into a wonderful plant. 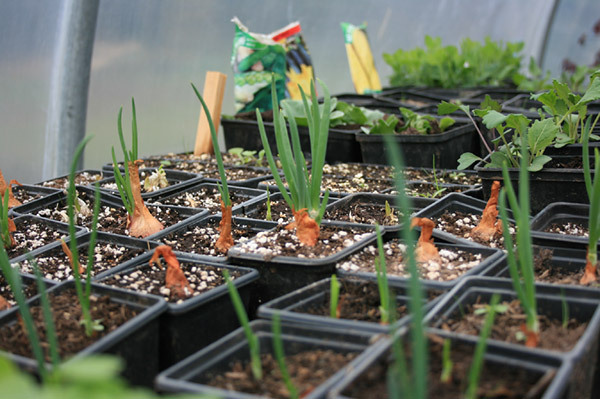 At the moment we’re busy potting up last years rooted cuttings which have gone through the winter pretty much unscathed and produced some serious roots. It’s our third year and we’ll be potting our two year old plants up ready for selling in the summer. We’ve learnt loads over the last 3 years about raising and selling plants, but most of all we’ve realised customers buy with their eyes. By that I mean they want plants with flowers and preferably with a scent. There are of course the old stand by’s like evergreens, box hedging, the conifers etc … but in the main people want colour and as much of it as you can give them! 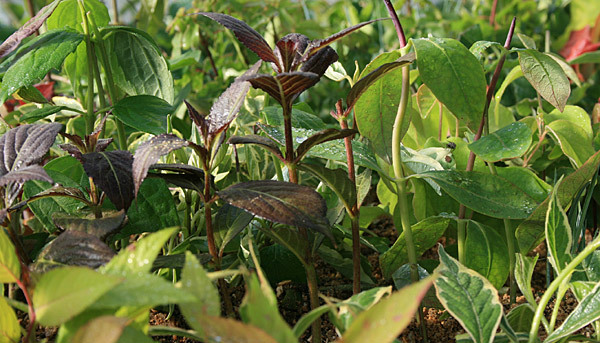 Tip for anyone starting out growing plants for profit … Seek out one or two unusual varieties of a plant species and make your customers aware you stock the plants, or if you don’t now you will in the future. Most important of all make sure the plants you raise and sell are not protected by Plant Breeders Rights. Other stuff we’ve been up to in April. 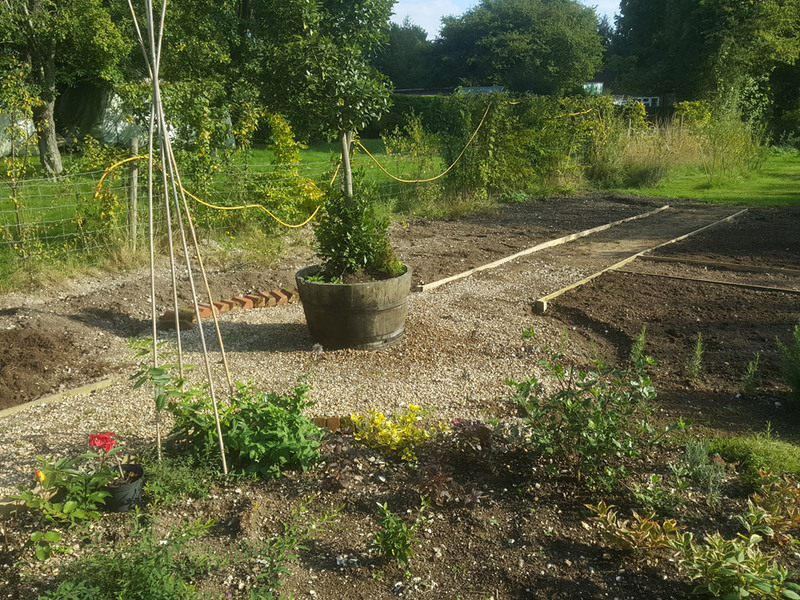 We’ve changed the layout of the bottom plot this year to make way for the new outbuilding which has meant we’ve had to shift the cutting bed and the compost heaps. Also created a dedicated work area adjacent to the polytunnel as it felt more central to nursery. I’ve also been top dressing my borders and beds with a good mulch of compost. My neighbour swears by it and every year she buys eight bags of conditioner and adds it to the surface of the soil. She doesn’t dig it in but instead let’s the worms drag it down over the course of the year. 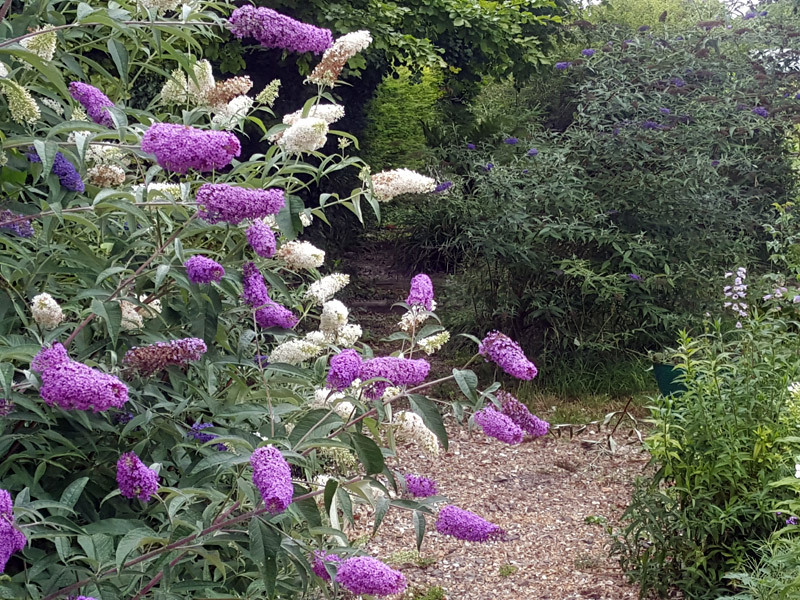 You’d never believe her garden was on chalk as the soil has turned into this gorgeous friable soil AND growing very nice rhododendrons. On chalk yes! 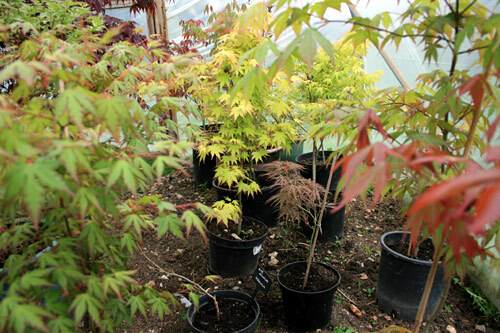 The Acer’s are waking up and putting on some good growth now. I bought these as small 10 inch plants on EBay in early 2013 for £6 each and just a year they are starting to look like great little plants. Just as soon as any sign of frost has passed they can moved from the polytunnel to sheltered position outside. 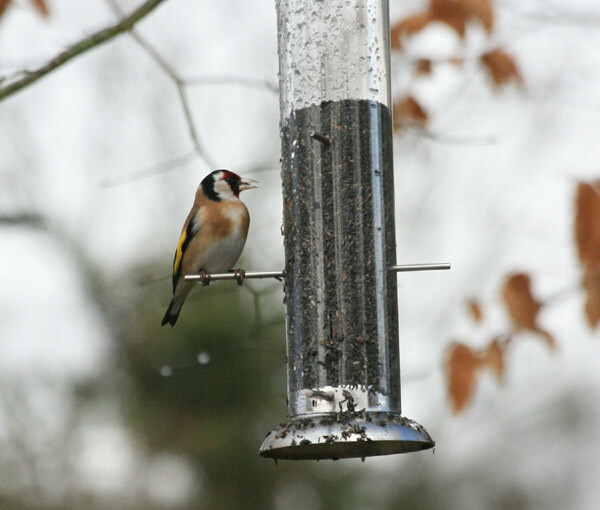 Also spotted our old friend the Goldfinch on the feeders this week. A welcome visitor to the garden. Really busy time now for us with all that’s going on in the garden but will try and post again soon. As always please feel free to drop us a comment with any questions.